Shopping for Halo Construction Toys? 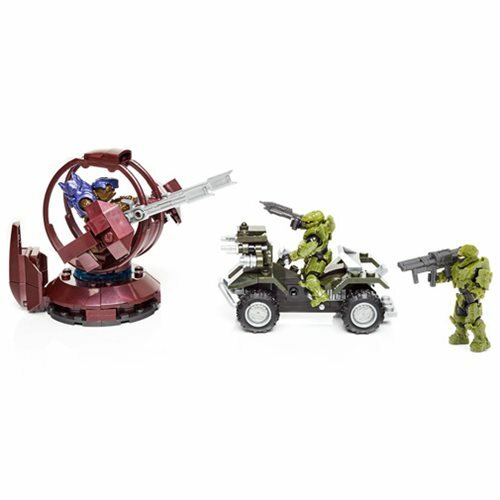 Prepare for the ultimate showdown between Covenant and UNSC forces with this Mega Construx Halo UNSC Gungoose Rampage Playset. This playset features a buildable UNSC Gungoose vehicle with treaded rubber wheels and a buildable rotating Covenant Shade Turret. It also includes 3 detailed, articulated mini-figures which include 2 Spartans and 1 Grunt. Each figure comes with detachable armor and weapon accessories. Be sure to collect and combine with other Mega Construx Halo playsets (sold separately) to build and expand your Halo Universe! Ages 8 and up.